Download Valerian and the City of a Thousand Planets in Digital HD from the iTunes store. Valerian and the City of a Thousand Planets images are © EuropaCorp. All Rights Reserved. Ever since Luc Besson (The Fifth Element) was a ten-year-old boy, he has been fascinated with the French graphic novel Valerian and Laureline and has been trying to make it into a major motion picture for years. He even waived his salary for the film since it was a lifelong passion of his. This year saw the fruit of his labors as Valerian and the City of a Thousand Planets made its way into theaters. While it wasn't necessarily the box office blockbuster he was hoping it would be, it was a stylized film that was very distinctly a Luc Besson production. For those who love his work and/or enjoyed the movie, they can own it on 4K Blu-ray, Blu-ray, DVD and digital download on November 14, 2017. 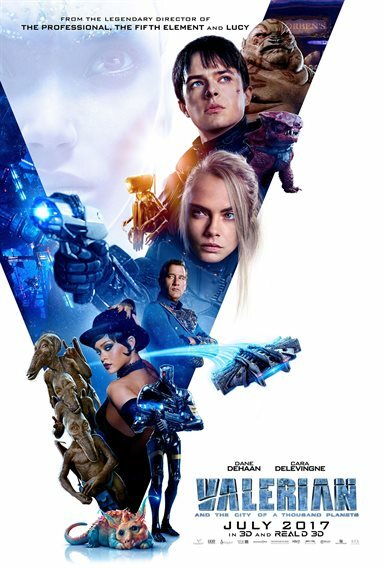 Major Valerian (Dane DeHaan; The Amazing Spider-Man 2) is on a mission in space with his partner Sergeant Laureline (Cara Delevingne; Suicide Squad) and their latest adventure is to recover a piece of stolen property, which takes them to "the market". Of course, they retrieve the converter and bring it to the Commander (Clive Owens; The Bourne Identity) but they quickly discover there are darker forces at work. When a mysterious group shows up and abducts the Commander, Valerian and Laureline must follow to retrieve him and stop the group. However, there are also a few other issues at play here…1) Valerian and Laureline have feelings for each other and the Major is always trying to win Laureline over, 2) the Commander isn't so innocent and the mysterious group isn't so evil and 3) Valerian had a strange dream that isn't really much of a dream. In his dream, the "Pearl", a civilization of peaceful alien creatures, are crying out to him for help. It turns out they are not a dream but the Commander's nightmare who he is trying to destroy. Besson has a unique way of telling science fiction stories and Valerian follows that same mold. With an artistic flair, he graphically paints a picture and blurs the lines between perception and reality. Like with Leon: The Professional, he infuses his stories with emotion that engages the viewer even more than the action. He is a true master storyteller and his films are generally worthy of analysis and reflection. This cast rises to the occasion and DeHaan and Delevingne have an easiness about them that makes their relationship believable. DeHaan doesn't look like your typical leading man hero and when you close your eyes one would swear they were listening to Keanu Reeves speaking – his tone and inflection are that similar. Delevingne always seems to be solid in her roles and this one is no different. The supporting cast, including Owens, Rihanna (Bates Motel), Herbie Hancock (‘Round Midnight) and Ethan Hawke (Training Day), frame the two leads nicely. A cameo from Rutger Hauer (Blade Runner) is short but effective. The 2160p high definition video is exceptional and the colors really pop off the screen. The contrasting hues are generally vibrant and powerful and help to set the scene beautifully. Besson's films have so much detail and this one is no exception. The quality enhances these minute bits and pieces and is something to be admired. The Dolby Atmos audio packs a punch that is full-bodied and robust. The laser blasters are nicely done and the overall sound is terrific. The eclectic soundtrack offers some older material but the songs sound sharp without any artifacting to speak of. 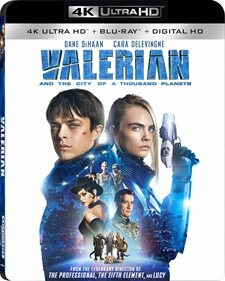 The 4K Blu-ray has a few extras including citizens of Imagination: Creating the Universe of Valerian, To Alpha and Beyond: Production and Stunts, Denizens of the Galaxy: Humans and Aliens, The Final Element: Visual Effects, and Wrap Up. The movie is lackluster at times and definitely too long but it has a certain feel to it the will appeal to some viewers. I must admit that I didn't hate it as much as I thought I would based on the feedback I had heard when it was released in theaters. For true Besson fans, this is a must own movie. I so hope this movie is good. I really want to see it.